President Barack Obama gave what even he described as a "Bar Mitzvah speech" at the Union for Reform Judaism (URJ) Biennial on Friday afternoon. Love him or hate him, the President gave an impressive speech that earned him no less than 70 rounds of applause. In the speech, he not only defended his administration's record on Israel, but claimed that, "no U.S. administration has done more in support of Israel's security than ours. None. Don't let anybody else tell you otherwise. It is a fact." Telling the audience that his daughter Malia has been on the bar and bat mitzvah circuit, he took his daughter’s advice and gave a D’var Torah about this week's Torah portion. Obama's message focused on the Hebrew word "Hineini" (I Am Here) saying that like Joseph from the Torah, he is here and ready to take on challenges even if he can’t predict them all. He also dropped some other Hebrew words, but didn't pronounce all of them well. He struggled to pronounce the term "Tikkun Olam" but fared better with other words and received a rousing ovation when he wished the audience a "Shabbat Shalom." Obama's "Shabbat Shalom" came with the acknowledgement that he knew it was still a few hours before the Jewish Sabbath. He said, "Even though it is a few hours early, I'd like to wish all of you Shabbat shalom." His former Chief of Staff Rahm Emanuel (or any other Jewish adviser for that matter) could have informed him that we Jews start wishing each other "Shabbat Shalom" as much as 24 hours prior to the actual Shabbat. My sense is that Obama knows this and his statement was a tongue-in-cheek reference to the criticism he received for hosting the White House Hanukkah party two weeks before the actual holiday. 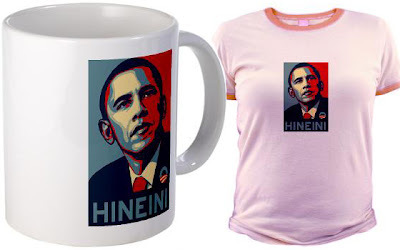 Who knows if "Hineini" will replace "Hope" as Obama's 2012 campaign slogan, but here are some Obama Hineini t-shirts and products just in case (available online). 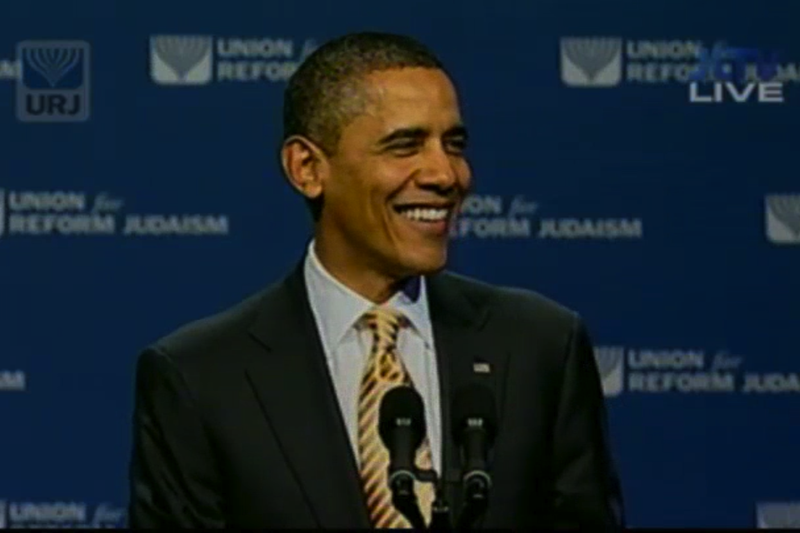 I was delighted to read of President Obama's speech at the Reform forum. I do agree that his administration did for the security of the State of Israel even more than his predecessors, even the other Barak aid so. Indeed, he doesn't get along with Netanyahu but I can't falt him fault him for this. He is still my president and I appreciate his attempts at Hebrew. Hineni I am too again for him.